The number traffic offences that deserve fines has been increased from July 15 which includes ten new offences, the Director of Traffic Administration and Road Safety SP Indika Hapugoda said. Speaking to the Daily Mirror he said the present number of 23 traffic offences had been increased to 33 with spot fines. About 100,000 Police fine books had already been sent for printing.“10,000 books have been delivered to 489 Police Stations in 42 Police Divisions,” he said. 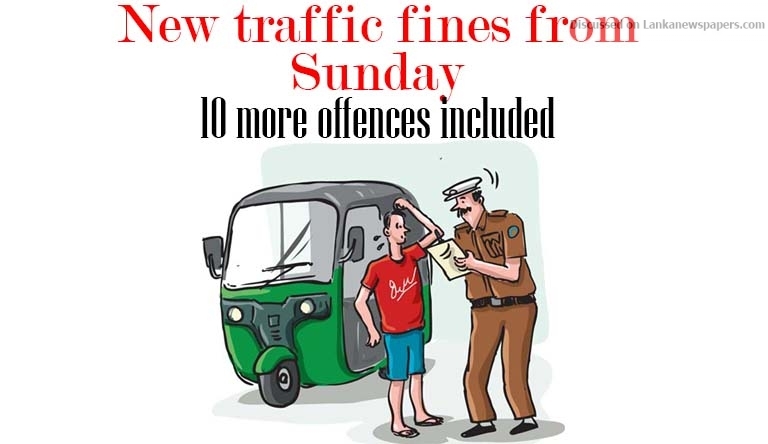 Traffic fines for additional offences had been amended to Rs.1,000 as a minimum fine and a maximum of Rs.3,000. 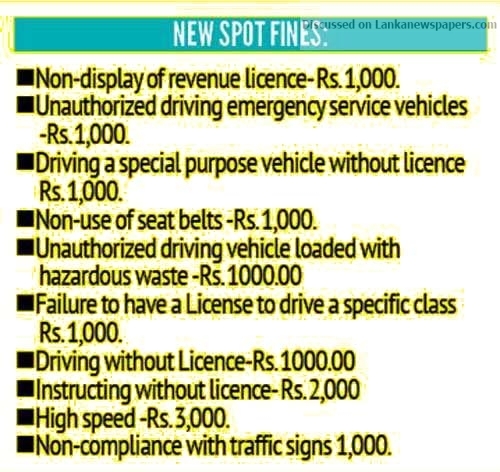 “The fine for breaking speed limits has been increased to Rs.3,000 from Rs.1,000. The high speed fine will have to be paid within 14 days; after 14 days the offender will have to pay double,” SP Hapugoda said. “The traffic fines would be implemented following an Extraordinary Gazette notification that was issued on January 15. “It was not implemented until now and would come into operation on July 15. Fines going upto Rs.25,000 for seven traffic offences such as drunk driving will be added as spot fines after receiving Cabinet approval,” he said. The fines applicable to the carriage of persons in excess of authorized number in private coaches and of goods other than personal luggage in motor cars or private coaches, carriage of persons or passengers in excess, authorized number of goods other than personal luggage in omnibuses, Carriage on lorry or motor-tricycle van of goods in excess of the maximum load or maximum axle load, exceeding the number of persons carried in a lorry and failure to carry the emission certificate or fitness certificate of a vehicle has been revised to Rs. 500.